Gold Girls Take Over the State Building! A bunch of teenage girls, a few CEOs, and senators all walk into a building…no, it’s not the beginning of a joke it’s the Girl Scouts’ bi-annual legislative breakfast! 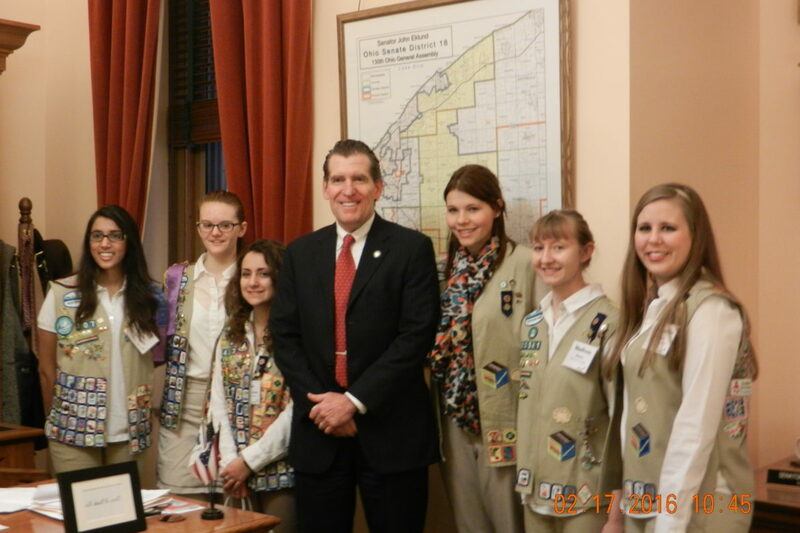 On Wednesday, February 17, 2016 the CEOs of three Girl Scout councils in Ohio and some of the 2015 and 2016 Gold Award recipients from Ohio hosted a legislative breakfast at the Statehouse in Columbus. Our girls got to have breakfast with members of our state’s legislature, share a display about their own Gold Award project, and show our lawmakers some of the awesome things that Girl Scouts do in our great state. They even convinced a senator to sing the Brownie Smile song. Pretty cool, right? We spoke with a few of our attendees about the event and they were excited to share their wisdom and memories with us. How has receiving your Gold Award impacted you? What advice would you give to younger Girl Scouts? Want to explore how your Girl Scout can change her community? Check out our Highest Awards and start her on her path to becoming a Gold Award recipient. Not quite ready for a highest awards project? Try out a simple Take Action project while completing a Girl Scout Journey or participate in our annual Take Action Weekend (check our Program Event Guide in the fall for the date and more information) with your troop.